You are here: Home » MoneyTalk » Additional Topics » Do You Really Need to Warm Up Your Car in the Winter? For some, it used to be common wisdom that you should let your car idle for quite a while before driving it to “warm up the engine” in the winter. But, do you really need to warm up your car in the winter? It actually doesn’t matter if you do or not! In fact, warming up your car in the winter can damage your engine and shorten its lifespan. Whether you are warming up your car while you get ready for work in the morning or it’s idling because you’ve always thought it can “warm up” the engine, it’s not good for it. When you’re idling in the cold, it can strip the oil from your engine’s cylinders and pistols, decreasing their lifespan. When your car runs, the internal combustion engine uses pistons to compress air and vaporized fuel together in a mixture within the cylinder. This mix is then ignited, causing a combustion that powers the engine. When your engine is cold, the gas is less likely to evaporate and create the correct ratio of air and fuel. So, the engine will run on this rich mixture until the engine reaches about 40 degrees Fahrenheit. But, when your car is idling, you are putting extra fuel in the combustion chamber to burn, which can get in the cylinder walls. Gas is a great solvent, so it can wash the oil off the walls when you’re idling in the cold for an extended period of time. This causes the life of your piston rings and cylinder liners to decrease, and the use of extra fuel when the engine is running is increased. Idling your car barely does anything to warm up the engine, so the fastest way to warm up your engine to 40 degrees is to start driving it in order to switch to the normal fuel to air ratio. Since you shouldn’t let your car idle for long, it can also be said that hopping in and just gunning it will put unnecessary strain on the engine. You can start the car, take a few minutes to wipe off any snow or ice from the windows, and then go on your way. For the first 5 to 15 minutes of your drive, take it easy for the first part of your drive to let the engine warm up before doing any excessive driving like accelerating in a short time span. Nowadays, though, the newer the car is the more likely it can accommodate startup in cold weather quickly because of the sophisticated engines. Initially, warming up your car came from a time when carbureted engines dominated the roads. It’s been about 30 years since they were more common which – if you learned to drive from parents or grandparents – would explain why we’ve continued to warm up our cars under the impression it’s better for the engine. If you do own a carbureted relic, you might want to continue warming it up. 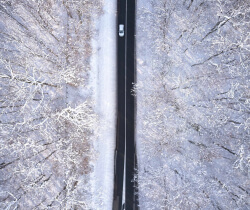 Car maintenance isn’t necessarily tied to one season anymore, especially since modern cars don’t require specific attention during certain times of the year like your parents or grandparent’s cars might have. There’s not much to do, other than things you should be doing already. Check your owner’s manual – Don’t rely on your weather forecast to determine your car care. They may have some regular maintenance advice for your specific make and model. Swap out for winter tires – If you live in an area where temperatures fall below 45 degrees regularly, winter tires are recommended. They can give you better traction when turning. With that said, you should also be checking your tire pressure weekly. Keep more gas in your tank – This is also a long and common word of advice. Air carries moisture and water that can freeze and crystallize. The more gas in your tank, the less air which means there is less of a chance of ice forming inside where it could get into your fuel lines and cause trouble. The rule of thumb is half full or more. Never use hot water to melt ice on your windows – Basic science demonstrates this technique can shatter your window. Use cardboard to give your wheels tractions – If you’re stuck in the snow and have to get somewhere, sticking cardboard under your wheels will help give them the traction they need to get going. Raise your windshield wipers – If you park outdoors, leave the windshield wipers raised up to prevent them from freezing to your windshield. Most importantly, you should never use your wiper blades to remove ice, frost, or a mountain of snow from the windshield.